DDA Lucky Draw Narela, Vasant Kunj, LIG, MIG, HIG, EWS: Results declared in May 2019, Check Results for Vasant Kunj, Narela & Dwarka Flats – LIG | MIG | HIG | EWS Flats in Delhi. DDA Housing Scheme 2019 DDA Housing Scheme 2019 Online Registration Application Form Last Date Download Brochure. DDA is now ready to launch its new DDA Housing Scheme 2019, registration starter from 25th March 2019 to 10th April 2019. If you want to home in Delhi then it is the best opportunity for you. DDA offers approx 18,000 flats at Vasant Kunj and Narela, including 450 High Income Group, 1550 Middle-income group, 8300 Low Income group and 7700 Economic weaker section flats. 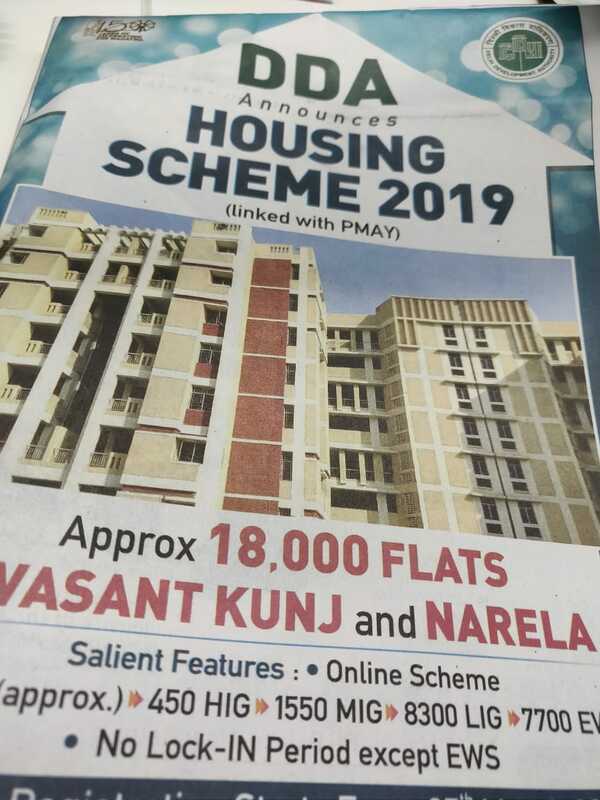 Apply Online DDA Housing Scheme 2019 have 1200 three-bedroom, two bedroom and one-bedroom flats in South Delhi’s Vasant Kunj. The new housing scheme is costliest till date such as Three-bed room flats starting from Rs 1.4 crore to Rs 1.7 crore. Two-bedroom flats is starting from Rs 66 lakh to Rs 1.4 crore while the one-bedroom flats is started in the range of Rs 22.5 lakh to Rs 56.3 lakh. In the previous year DDA offers flats at cost price on no profit-no- loss basis, but this year DDA taken the market value mainly Vasant Kunj. In this year 1286 flats located in Vasant kunj including 336 three-bedroom flats. Most of the flats located in Narela in current housing scheme approx one-bedroom ones (8,164) or flats meant for economically weaker section. As per industry sources, Around 18000 flats will be offered in this year 2019 housing scheme. Results or Draw will be held in June. As per reports on Sunday, the draw for the dda housing scheme 2019, which had been fixed for June 22, has been postponed again and this time indefinitely. The draw was scheduled to be held at DDA headquarters, Vikas Sadan. For the first time the DDA will be ‘webcasting live’ the entire draw on the Internet with a dedicated URL (http://webcast.gov.in/dda/) for the same. The application records and the flats are randomized by appending random numbers to each application and each flat ans sorting them on random numbers. The randomized applicant records and the randomized flats are then printed on papers. printed form of randomized applicants record is called cross-reference of applicants and similarly the printed form of randomized flats is called Cross-Reference of flats. These cross references of applicants and the flats are then placed before the judges for checking to see that all the applicants and the flats are properly reshuffled/randomized. After their satisfaction the judges put their initials on these records. iii. A dwelling unit or flat in the Housing Estates of the Authority shall be allotted only to such person who or his wife or her husband or any of his/her dependent relations including unmarried children does not own in full or in part on free hold or lease hold basis a residential plot having area exceeding 67 sqm or flat/built up house having carpet area exceeding 67 sqm in the urban area of Delhi, New Delhi and Delhi Cantonment. v. Both husband and wife can apply for flats separately subject to fulfilment of eligibility conditions with the stipulation that if both are declared successful, only one shall be allotted a flat and the full amount of ‘Application Money’ of the other spouse will be refunded. vii. The income of applicants applying for EWS flats should not exceed Rs.3 lakhs per annum. There is no income criterion for other categories except EWS. The applicant can apply according to his/her requirement and affordability. All flats are located at Vasant Kunj and Narea. Picking of Lucky Numbers: Boxes having numbered coins 0 to 9 in each box are used for this purpose, one box for each digit are placed before the judges for deciding the starting positions for the applicants and the flats in the above said cross references where from the allotment process is to be initiated by the computer. The starting position for applicants is called the LUCKY Number for applicants and the starting position for flats is called the LUCKY NUMBER of FLATS. The Number of boxes to be kept depends upon the number of digits in total number of applicants and the total number of flats to be allotted. Mapping of Applicants and Flats / Allotment Process: The Lucky number of applicants and the flats picked up by the judges by the process are written on paper and the signature of the judges are taken on it. After this, the lucky numbers of applicants and the flats are fed into the computer and the computer makes allotment by mapping the applicants and the flats starting from the positions corresponding to the lucky numbers in the cross references taking care of CHOICES of LOCALITIES of applicants and the reservation of various reserved categories. While making the allotment , the physically handicapped persons are allotted the flats first up to their specified reservation as they are supposed to be given the ground floors. The reservation to each category is provided locality wise. The reservation for PH, SC, ST, Ex-service Men (EX), War widows etc is kept as per their scheduled quota. DDA Housing Scheme 2019 will open from 25-MAR-2019 to 10-MAY-2019. The applicant can fill the Application Form online. To fill the Application Form online, instructions, brochure, and application form are available on the website of the following banks. Before filling up the online application form, applicants are advised to carefully go through the Brochure and instructions. The applicant may or may not have the account in these above banks for applying. In the case of SC/ST applicants, the reservation is swappable. Thus if the numbers of ST applicants is less than the number of flats reserved for ST,the balance flats shall be transferred to SC quota and if there also sufficient number of applicants are not there the balance quota is transferred to general category. Similarly for SC. So far as other categories are concerned ,in the event of there not being sufficient number of applicants for any one (other than SC or ST) of the categories and the number of flats of any category are more than the applicants of that category, than the excess flats is given to general category after meeting the reservations. Since the number of applications is huge, DDA will be assisted by C-DAC (Centre for Development of Advanced Computing) in carrying out the draw, which will be held at the development authority’s Vikas Sadan headquarters. The draw for the Delhi Development Authority’s (DDA) housing scheme has been postponed again. The draw has been postponed quite a few times due to technical glitches triggered by a huge number of applications. The Delhi Development Authority (DDA) has launched a new housing scheme for the home seekers of the state. This time, DDA has launched the Open Housing Scheme in which the home seekers can buy DDA residential flats without involving in the process of Registration, Application, Draw Result and Allotment. Instead of this, the buyers can directly buy the flat of his own choice through online mode. Here we have provided the complete details of DDA Open Housing Scheme 2019 i.e. How to apply online, Eligibility Criteria, Application Fee, Booking Amount, Selection of flats etc. Under the "DDA Open Housing Scheme 2019", the DDA residential flats will be allotted on “First Come, First Serve Basis”. Therefore, all the home seekers or buyers who are willing to buy an affordable residential flat at an affordable price will have to apply online for 'DDA Online Housing Scheme 2019' immediately. After filling the application form and choosing the Flat of your own choice, you will have 30 minutes time for online payment. During this duration, no other buyer can choose this flat.